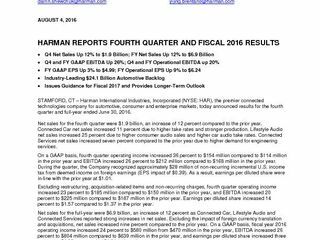 STAMFORD, CT – HARMAN International Industries, Incorporated (NYSE: HAR), the premier connected technologies company for automotive, consumer and enterprise markets, today announced results for the fourth quarter and full-year ended June 30, 2016. Net sales for the fourth quarter were $1.9 billion, an increase of 12 percent compared to the prior year. Connected Car net sales increased 11 percent due to higher take rates and stronger production. Lifestyle Audio net sales increased 25 percent due to higher consumer audio sales and higher car audio take rates. Connected Services net sales increased seven percent compared to the prior year due to higher demand for engineering services. On a GAAP basis, fourth quarter operating income increased 36 percent to $154 million compared to $114 million in the prior year and EBITDA increased 26 percent to $212 million compared to $168 million in the prior year. During the quarter, the Company recognized approximately $28 million of non-recurring incremental U.S. income tax from deemed income on foreign earnings (EPS impact of $0.39). As a result, earnings per diluted share were in-line with the prior year at $1.01. Excluding restructuring, acquisition-related items and non-recurring charges, fourth quarter operating income increased 23 percent to $185 million compared to $150 million in the prior year, and EBITDA increased 20 percent to $225 million compared to $187 million in the prior year. 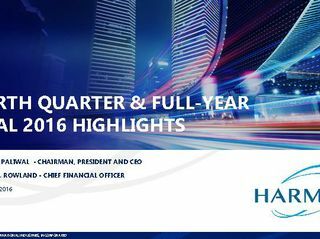 Earnings per diluted share increased 14 percent to $1.57 compared to $1.37 in the prior year. Net sales for the full-year were $6.9 billion, an increase of 12 percent as Connected Car, Lifestyle Audio and Connected Services reported strong increases in net sales. Excluding the impact of foreign currency translation and acquisitions, net sales increased nine percent compared to the prior year. On a GAAP basis, fiscal year 2016 operating income increased 24 percent to $580 million from $470 million in the prior year, EBITDA increased 26 percent to $804 million compared to $639 million in the prior year, and earnings per diluted share increased three percent to $4.99 compared to $4.84 in the prior year. Excluding acquisition-related items, restructuring and non-recurring charges, fiscal year 2016 operating income increased 22 percent to $677 million compared to $554 million in the prior year, EBITDA increased 20 percent to $836 million compared to $699 million in the prior year, and earnings per diluted share increased nine percent to $6.24 from $5.71 in the prior year.